Joy Creek Photo Archive (c) all rights reserved This was introduced by English nurseryman Collingwood Ingram from Kyushu, Japan. It is noted for its shiny leaves and its medium size. The panicles of flowers are not large but are abundant. They have fewer sterile florets than many selections. Individual panicles on Hydrangea p. `Kyushu' measure up to eight inches. 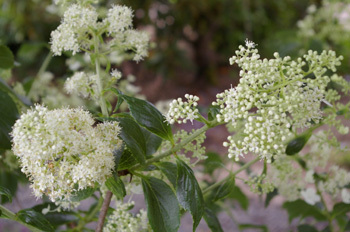 Because this graceful shrub is not tall but upright, it is an excellent candidate for a smaller garden. Summer. 6 ft. x 5 ft.